The desperate parents of a severely autistic teenager fighting to bring him home are furious at plans to move him another 200 MILES away. Nina and Clinton Ni claim son Tianze, 17, is being held “prisoner” in a hospital in Middlesbrough more than 200 miles from his home in Glenrothes, Fife. The distraught couple want him home but have been denied their wish because of a lack of specialist care in Scotland. We revealed in September a dire lack of funding meant there was no option but to send Tianze to England. Now doctors want to move him to a hospital in Northampton in the Midlands. 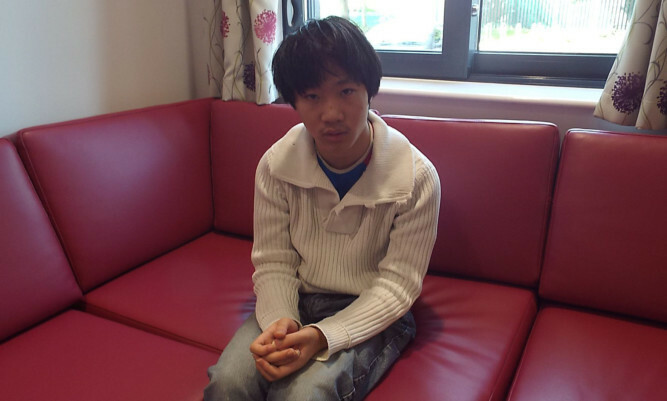 Tianze was sent for an assessment to West Lane Hospital in the Teeside town in May. Six months later he remains stranded because Fife Council cannot find the expert care he needs near the family home. And the agony of being without her beloved son was compounded last week when Mrs Ni was told the day before Tianze’s birthday that he may be moved to St Andrew’s Hospital in Northampton. The family’s ordeal comes after a leaked report revealed 3,000 people with severe mental disabilities south of the Border are being cared for in “inappropriate” hospitals. The inquiry report, commissioned by NHS England chief executive Simon Stevens, calls for urgent action to discharge patients in hospitals and mental institutions. The report says it is “not acceptable in the 21st century for thousands of people to be living in hospitals when with the right support they could be living in the community”. Scottish campaigners fear the situation is worse north of the Border. The Scottish Children’s Services Coalition said as many as seven Scottish children are sent to England each year, with others kept waiting months in “inappropriate” psychiatric care, with “virtually no support”. An online petition to bring Tianze home has reached nearly 10,000 signatures. A decision on whether he will be sent to Northampton will be made tomorrow. Sophie Pilgrim, director of child mental health charity Kindred Scotland, is preparing alternative proposals for him to be cared for closer to home, Mrs Ni said.